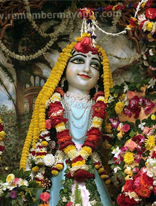 Lalitha devi temple is one of the two Shaktipeeths present in Allahabad. A Shaktipeeth is a temple built at a place where some body part of Sati a believed to have fallen from the sky. Kalyani Devi temple is the other Shaktipeeth in Allahabad and at both these places; fingers of Sati are believed to have fallen. The temple located near the Bargad Ghat, which is one of the more popular bathing ghats on the banks of Ganga. The main shrine of the temple is a Ling made of mercury and is adorned with bright clothing and gold ornaments. The best time to visit the temple is during any of the two narvatris, during which a fair is organized. The main event of the fair features worship of images brought all the way from Bengal. After the fair, these images are immersed in the Holy River.